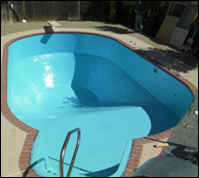 Following the process below during your vinyl liner conversion, will give you a trouble free pool for years. 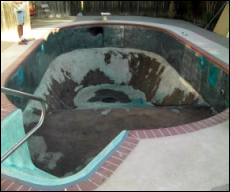 Remove the liner and pressure wash. 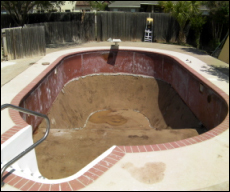 Most vinyl lined pools have a sand/grout bottom. 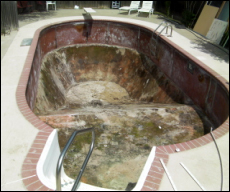 Be sure to expose all deficiencies and remove loose debris. Stainless walls / fiberglass walls all have to be sanded thoroughly and gel coat and/or previous paint removed. 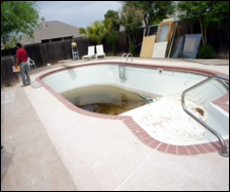 Smooth transitions are required for proper installation. 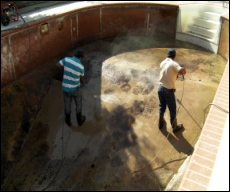 Once the prep is completed the primer bond coat is applied over the entire substrate. Sanding between every coat is required. 1 ½ oz. 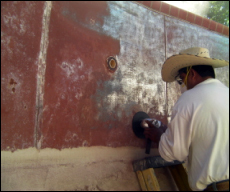 fiber reinforcement is installed followed by the recommended number of color top coats. No more Vinyl Liners or structural deficiencies. Ultraguard Super Epoxy 1½ oz. Super Bionic Fiber Reinforcement will solve any surface issues and keep anything from ever happening again. I believe all of our Ultraguard Super Epoxy Conversions can be executed with precision as a DIY. 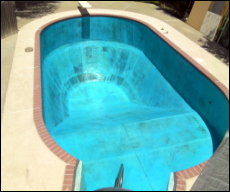 If you have the time and the labor power, with just a few people you can have the maintenance free pool you deserve. 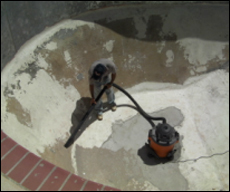 No one else, no other product or no other system on the market is capable of the durability, longevity and strength of a Ultraguard Super Epoxy Conversion. 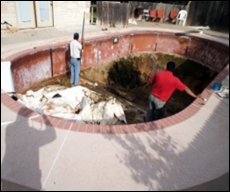 For commercial projects you can utilize your staff and save money. 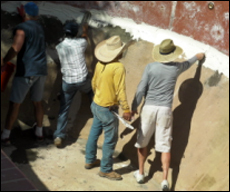 An instructor for the day is available for your project to teach you every aspect hands-on. 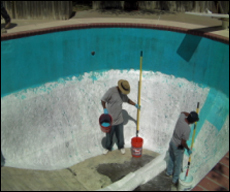 Regardless of your choice Super Epoxy has the answers!